Save with Sale coupon at Canadian Bulk Barn stores. 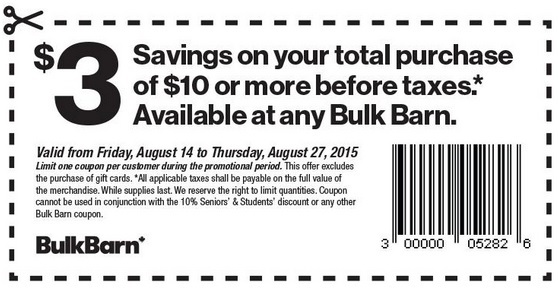 Print the coupon, bring it to your nearest Canadian Bulk Barn store and tak $3 off your purchase of $10 or more. Limit one coupon per customer. Official source is Bulk Barn Canada. For more information about the promotion visit your nearest Canadian Bulk Barn store. Offer expires 08/27/2015.